When I'm not on Ravelry, I'm on Threadless and that's where the inspiration came from for my latest project. Earlier this month, Mezo submitted a crazy awesome shirt design called Flashorse Dance. You could say it was an underground hit that deserves to be above ground — and on my body. Threadlesser Pyr4lis was entranced, too. She asked if anyone could make a pair of legwarmers based on the design. Loving the colors and buzz for a new project, I said YES. She chose the thick Wool-Ease yarn because she gets pretty cold in the office. And they are going to be warm for sure. And loooong so they can be super-scrunchy! I started the first one this week and here it is ... Hold your horses UPDATE: These crazy guys are turning into armwarmers instead. I tested them on a skinnier girl Friday night and they are a bit snug. So I'm going up in size for the legs (and I'll finish those first). But these cozy armwarmers-in-progress will be up on Etsy for anyone who wants them! Heck, I might even do the headband, too, if I have yarn left! 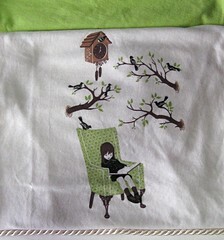 I'm also making her a Threadless tee pillow, which will be all set in a few days, too! I'm heading out to buy the pillow form tonight. It's been more than a week. I don't write. I don't call. How dare I?! Well, I've working hard on some advance Etsy orders that came from my some wonderful Threadless friends. Here's a sneak peek. I'm now taking advance orders for my Etsy shop. What do you want? I have t-shirt pillows and handknits made to order. And with the help of my wonderful Threadless friends, I already have some pending orders! So if you want something soon, you better act fast. If you're interested in a pillow made from a Threadless tee, here are your choices. Prices will start at $25. You could also send me a large t-shirt and I can make a pillow from that. See something you like? Contact me on Etsy! It's gonna look gorgeous when I eventually finish it. It requires just enough attention so I can't work on it while I'm watching TV or chatting during knit groups. And those are exactly the two times I knit. I have not yet returned to the summer blanket though. I have enough yarn now. But I'm worried about the "lacey" look. I'm gonna strangle one of my toes in this blanket! (If a toe could be strangled.) It is very, very soft. And a great yarn buster for all that Yarn Bee I have. I'm thinking about possibly attaching it to a blanket backing when it's all done. Just not sure how yet. 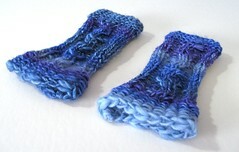 ^ My very own pair of fingerless mittens, made from handspun Betsy Ply yarn and some Lamb's Pride for the cuffs. ^ The moss scarf, which I'm self-imposing a March deadline for. It is green, afterall. 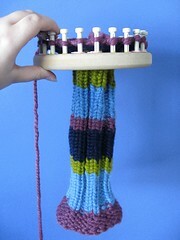 ^ And the ponchette that I started last night. It's a fun, easy knit. But if it doesn't look flattering on me, it will go in the Etsy box. I'm not sure I can pull off a poncho. Speaking of Etsy, I'm planning to take a mini knit break next week. 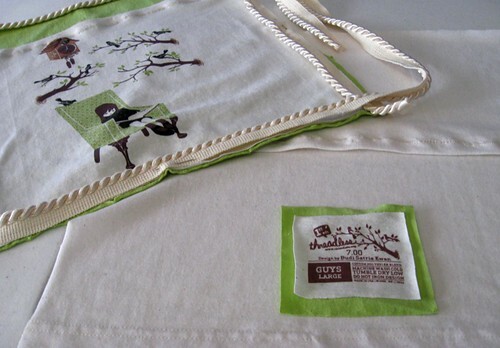 It's time to make some pillows for the shop launch! But the break won't be long because as of today, I also have two knit commissions to work on. Yay!! Cowl (sound). It just sounds wrong whenever I say it aloud. And angry ... or shy, like trying to hide something. I guess it does hide your neck. I made a cowl on a loom this past weekend and it's soo comfy! I learned a new stitch, too, called the mock crochet or Z stitch. I love how open it is. The pattern can be found at A Knifty Knitter's Journal. Detailed directions for the stitch are at Pieceful Creations. This is a great one-day project or if you're a little slower like me, two-day. The yarn is Plymouth Yarn Baby Alpaca Worsted Glow. It has sparklies! Back to weird words ... how about chenille (sound)? Everytime I say "sha-neil", I feel wrong. But it's right. "Sha-nell" is the wrong way. Oh well! Mitten fight! On the right side, there's the mitten done exactly to pattern, row for row. Who needs gauge swatches?! He's a small guy and he might not fit, but that didn't stop the knitter who spent four hours on him. His opponent on the left is a mutation of the pattern, with a longer body and garter-stitch cuff. And he's the favorite to win today. 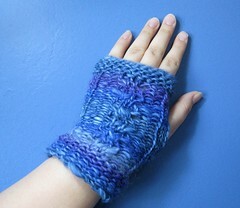 The cozy mitts pattern is in Loom Knitting Pattern Book by Isela Phelps.